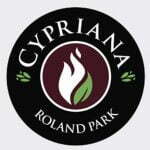 Cypriana, Maryland’s first authentic Cypriot restaurant and bar is now open in Tuscany-Canterbury, across from JHU Homewood Field. Cypriana has evolved from its humble beginnings in 1991 as Downtown Baltimore’s first gourmet food cart, to a new 7,000 square foot, 150-seat restaurant and bar. Opening in February on the ground floor of the Broadview Apartments at 105 W. 39th Street, Cypriana has enjoyed an overwhelming welcome from surrounding residents. Pulling from nearby Johns Hopkins, Roland Park, Guilford, and more, the heavier residential surrounding of the Tuscany-Canterbury community has certainly proved beneficial for business, which offers dinner seven nights a week and Sunday Brunch. Owned and operated by head chef, Maria Kaimakis and her husband Vassos Yiannouris, Cypriana’s menu features authentic small plates from Cyprus and beyond. Because of Cyprus’ unique positioning in the Mediterranean Sea and its diverse ethnic populations, the food draws from Greek, Middle Eastern, Armenian, and Turkish traditions and techniques. With a loyal following from their time serving the downtown business community, quick service menu mainstays like the grilled chicken pita and Best of Baltimore award-winning falafels have been adapted to the bar menu, while the increased horsepower of the new restaurant’s kitchen have permitted Chef Maria to up the offerings to include grilled octopus, grilled lamb rib chops, and house made Cypriot meatballs. “We’ve been blessed to serve this community for close to 30 years in more challenging settings. Now we can truly flex our muscles in a bigger, better setting with more bells and whistles,” stated Kaimakis. For more information on Cypriana, please visit www.cypriana.com or contact Maria Kaimakis at 410.627.0800 or maria@cypriana.com. MacKenzie Vice President Michael Gioioso represented Cypriana in the leasing of this new location. For retail leasing and sales information, please contact Michael at 410.494.4866 or mgioioso@mackenziecommercial.com.